When we initially designed our outdoor dining patio, we knew we wanted the space to be as green and lush as possible. To accomplish that, we opted to not build a formal wall around the patio, but instead created a living wall. This is what the area looked like after the patio and stairs (to the dining room) were built. 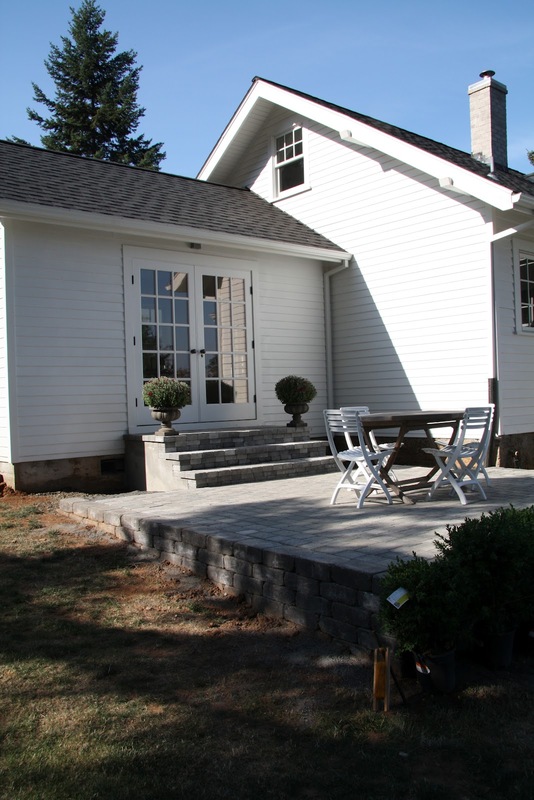 Because the yard slopes away from the house, we built a hardscape patio with a stone-style retaining wall to create the level space. In addition to accommodating the slope of the yard, we also liked the idea of not having to mow around or under the table and chairs during the summer months. Here I've propped English boxwood up around the patio to see what the living wall would look like. Although these were the tallest boxwood I had come across, they were still going to be fairly short up against the patio, especially at the end with the largest drop to the ground. 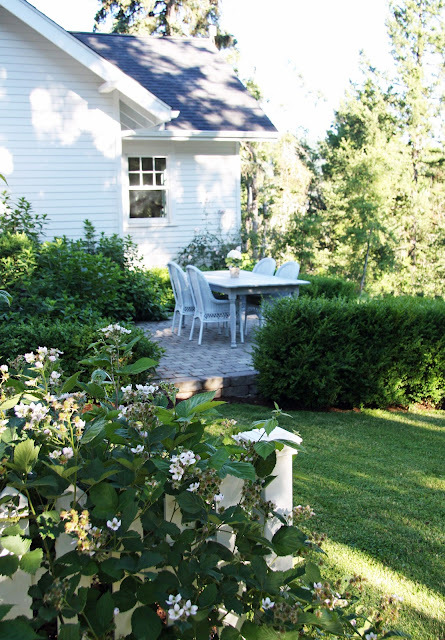 The patio is the same dimension as our dining room (12x16), which required over twenty plants. 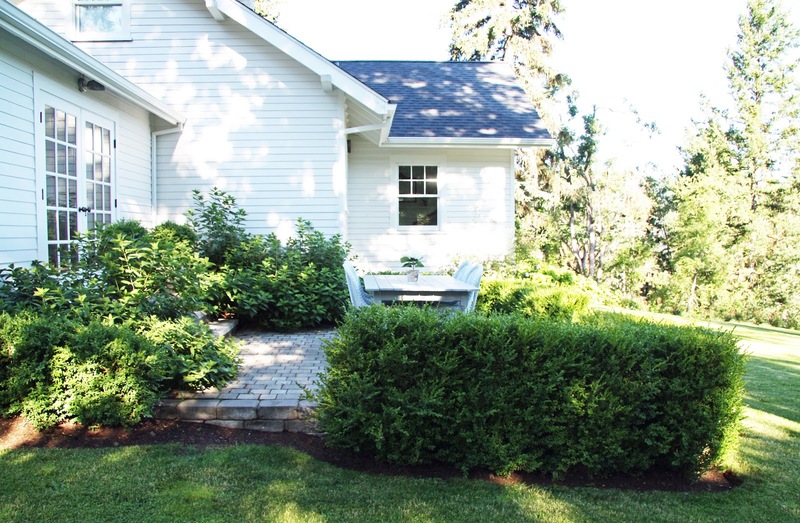 A year after we planted the smaller boxwood, I came across larger plants that were at least twice the size of the original plants. So we had a dilemma...wait patiently for the already planted but smaller boxwood to grow, or buy the larger ones to enjoy the living wall immediately because of the increased height. To resolve this question, I called the lovely Tara Dillard, a landscape designer who helped us plan the foundation plantings in the yard. She recommended switching out the smaller plants for the larger ones because we'd have to wait quite awhile for the smaller boxwood to grow that big. So that's what we did and we're so happy, despite the extra cost, the work to transplant the smaller boxwood elsewhere in the yard (in the flower beds) and of course, planting the larger boxwood in their place. The boxwood are very loosely shaped. I really do love the classic manicured formality of meticulously pruned boxwood hedges, but that aesthetic just doesn't seem to fit our yard. Beyond the fence line the yard is fairly wild. We used the fence to create a separation between areas of the property that are more vs. less managed. We wanted to create a lush yard next to the house, but also wanted to keep it on a manageable scale to minimize the maintenance of plantings, watering, etc. Soon the limelight hydrangea, which are on either side of both sets of stairs, will be blooming. I've already started to see little buds and I'm looking forward to seeing how they do this year. They've grown quite big over the past three seasons and although I have yet to cut them back, I will probably do a little pruning this fall just to keep them at an even height. Looks beautiful! I do love eating outside...it always makes me feel like I am on vacation. It looks beautiful. How long will it take them to hit full height? I'd love to add your idea to my house. I am pleased with the rug. We have them in our den, downstairs bath and our upstairs bedroom and all have lasted well. They're a great price too! Not sure exactly but I don't think they grow very tall so they are probably pretty close to full height, minus a few inches. I love the idea of a living wall. So much softer than a stone wall. Boxwoods are pretty slow growing in my experience, so I definitely understand your decision to switch to bigger plants when you had the chance. My husband and I just finished our patio and decided to do the boxwood look too for our hedge. We ran out and noticed that our new neighbors were ripping out theirs. Completely stunned that they were ripping these beautiful little bushes out, I decided to rescue some of the poor drying out ones that were going to get tossed!! It's sad because our old neighbor loved his garden and spent a lot of time and money in it only to have these new people rip it all out. At least I have some of the beauty in my garden now. Have a wonderful weekend Trina! What a great idea, and how beautifully it turned out. 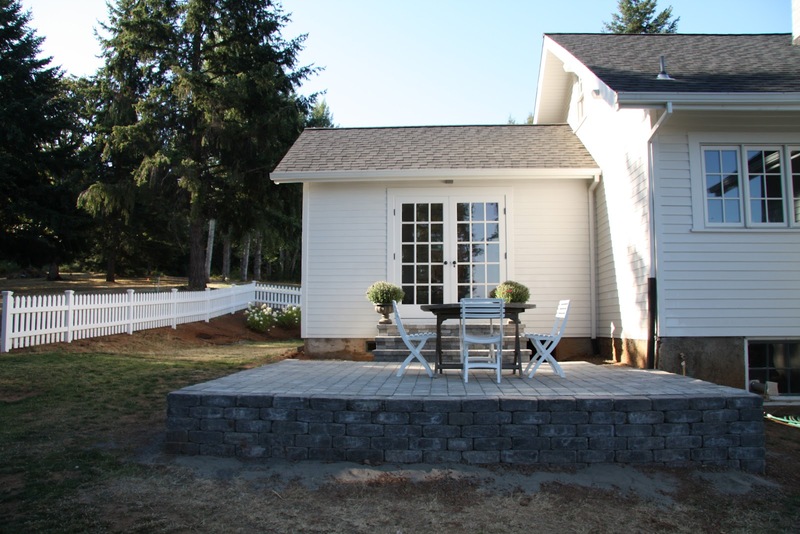 I love the idea of the raised patio and the perspective you have over your yard. I just love love it!!! To see the growth, amazing. Enough that the plants have taken residence. Providing their personality. Giving their voice. And, working with all you do. Making it better. I have been following your blog for 3 or 4 years now and I've never thanked you for all of your posts. They are thoughtfully written and beautifully photographed. Could you do a post in the fall about how to prune your hydrangeas? I acquired my first hydrangea in April and am a little intimidated about how to prune it. Also, we were in Portland two weeks ago and I took your suggestion and went to Rejuvenation. What an incredible store!!! Thank you for suggesting them in your spring post about that store. Your yard is just beautiful. I love the "wall", such a wonderful green addition. beauty of an idea. It looks wonderful. Just stunning, I love a slightly imperfect living wall, we had one at our last house and just about to plant one out behind our pool pergola. So very lovely . . . I am convinced that what our vision is for "a space" and how it is "actually" can sometimes take a few years to finalize. Even then, changes may have to be made. It is the creative fun of it all . . . and a bunch of hard work too. I plant . . . remove, add, take away and the next year make changes too. It is "part of the love" for me. Your home, setting, surroundings are inspiration for me and energize my creativity! Lovely indeed . . .
That looks amazing. I am, as always, completely jealous when it comes to your yard. It is absolutely divine! Lovely, I'd sit an sip an iced tea with you there any day! It looks perfect. We've put box around our home - but it will take a while to form a hedge, cause we made the cuttings ourselves to save money. This is beautiful. I love the green against the white. My ,limelight are just budding. Lovely natural play pen to coral adults and children to enjoy a meal under the stars....or a beverage....I really love the greenery sen-surround! I adore your patio, my husband and I have started a similar project, I fear it will take YEARS to complete! Have a lovely weekend! With every vision of your home, it is more beautiful than the time before. You have completed so many projects and the maturity and beauty of your plantings are astounding! Kudos, again, for all that you have created, including your beautiful children. What a great idea. I think you made the right decision in switching to the larger plants - life's too short to be waiting! You Guys never cease to amaze me!!! I love your home...inside and out!!! That is a lovely area to dine. We have done the same thing all around our porch, planting rather than building rails around the edges. Well done! I love how your "living wall" softens the edges of your patio. And your hydrangeas will be gorgeous next to your home. Send photos! Always love your blog pictures, your home is so beautiful. This looks so lovely and inviting. 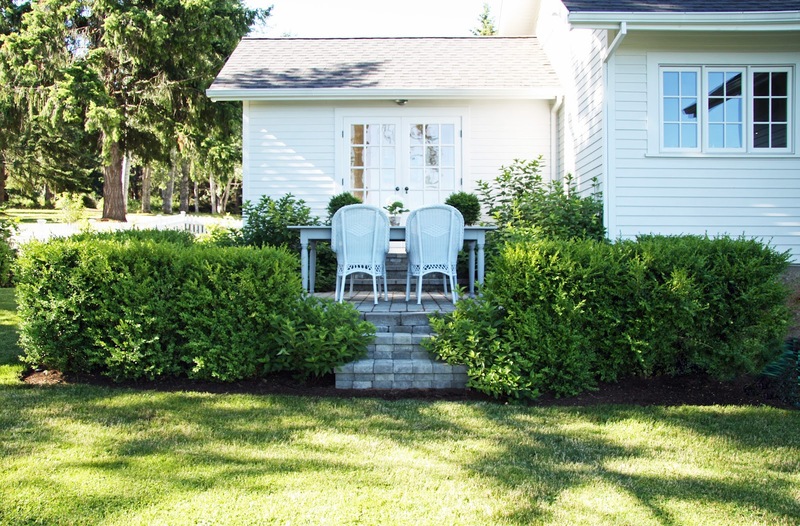 I have added boxwoods to my perennial beds and love the way they add structure and color year round, so I think you'll find you'll really enjoy the original plants in their new homes. This is such a great idea! I think that I might try and incorporate it somewhere in my yard, maybe not around a patio but to form some sort of "living" border that delineates an area. And I don't think deer like them either, do they?? Hi, Trina...I love your living wall! Such a great idea to go ahead and replant the larger ones and enjoy all that beauty now. I just found your blog, and it is absolutely beautiful!!! Can't wait to read more! I love how it looks Trina. I could just see you and your friends sitting and having a summer tea out there. Lovely. You and Mike do great work together. Your house is stunning inside and out. LOVE your living wall of boxwood and limelight hydrangea! 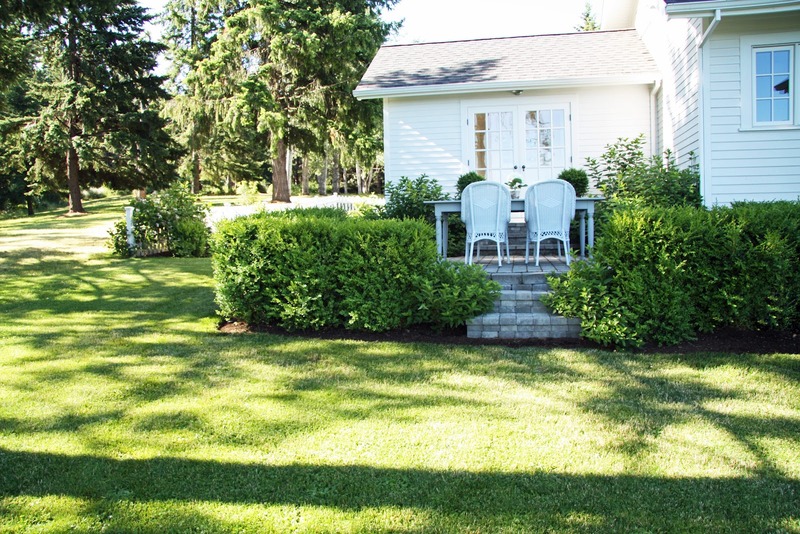 We planted maple trees around our acre of property but have thought of adding boxwood in between for a little privacy and beauty. I very like to be on your blog. I send a happy day from Prague, Czech republic. Eli. This is just gorgeous! I remember reading about your patio maybe last year...are those chairs really Pier One? You make everything look beautiful! We move into our house today and our yard was/is a mess from years of overgrowth. I keep coming back to your blog for a little inspiration and calmness that I get when I see the before and afters. Ours is definitely a before. 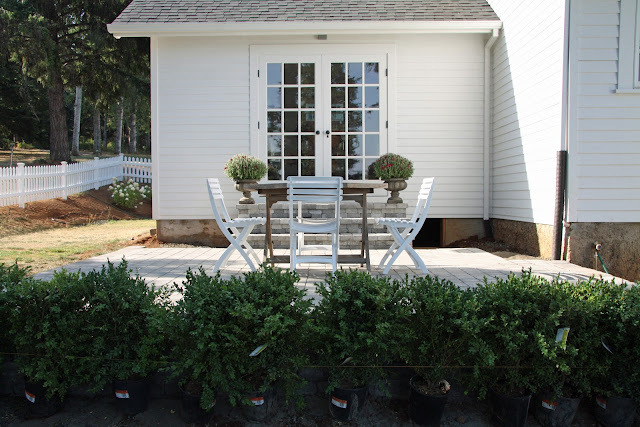 Your living wall of boxwood is doing a fantastic job of not only framing out your patio, but providing privacy and covering up the foundation as well. Beautiful! What a lovely patio! How long did it take to grow the shrubs? We did a little renovation for our patio with fake shrubs, the whole idea cost less than $500 (how2home.wordpress.com/2012/06/02/how-to-boxshrub/) Let us know what you think! Looks beautiful! My neighbors just did something very similar, but with flowering bushes and it turned out beautifully! I would love to do this at my house, but we will soon be moving (finally!) into our dream house. 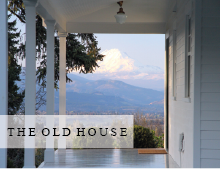 We too are buying a big old farm house. But that is a great idea to keep in mind for our new house! Hi Trina...your living wall looks lovely, so perfect for your patio space! We also have the slope dilemma coming right our of our dining room so I need to show Paul this, we were just talking about it last weekend...this will help a lot! Our white hydrangea that was 'over pruned' just bloomed this week...I thought it was a goner...so relieved! I'm sure yours are going to be stunning this year!! WOW, Love the pictures on this site, it looks like pure heaven on earth. You should turn one section into a b&b. I would come and stay! Great idea and it looks brilliant. I wish I could convince my husband of the merits of this approach. We are always arguing over this because I prefer to spend more money to get more established and larger plants and trees, where as he is the stingier one and is happy to buy plants as seedlings and wait for them to grow. It drives me nuts when you can literally have an instant garden theses days and not have to go through the painful stage of growing. Your garden and house are truly beautiful.